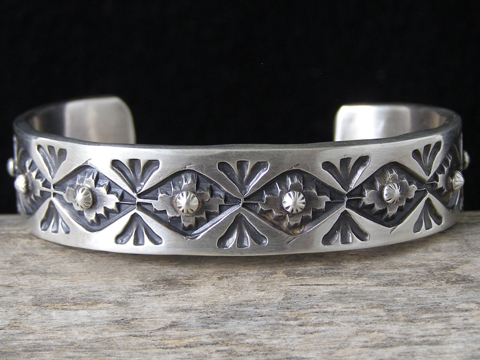 Sheila Tso Deep-Stamped Starred Button Bracelet size 6 3/8"
Sheila Tso is a hard-working Navajo silversmith and among that small minority of smiths who are women. She does very traditional work with good attention to detail. This uniform-width bracelet is beautifully and deeply stamped with small starred buttons ranged around the bracelet marking the equatorial center. Decorated with stampwork inside. Lightly brushed and oxidized to give it an old-time finish. Hallmarked S.Tso and stamped Sterling inside.